Anne Klein enjoys the fast pace of public relations and has a flair for special events and personal media relations. She started Giraffe Marketing to provide innovative and cost-effective marketing and public relations services to clients around the globe. Anne lives in Durango, CO, is the mother of 3 teens, and enjoys horseback riding, travel, fundraising and cooking. Our annual summer trip explores a foreign country; the goal: experience another culture, language, cuisine, and environment. 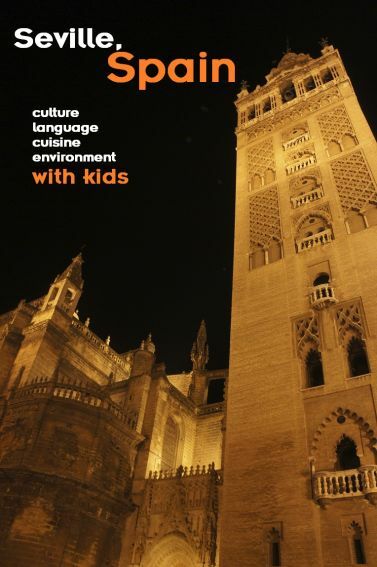 This summer posed a challenge as each of my three children were all taking a different foreign language in school: Japanese, French and Spanish. 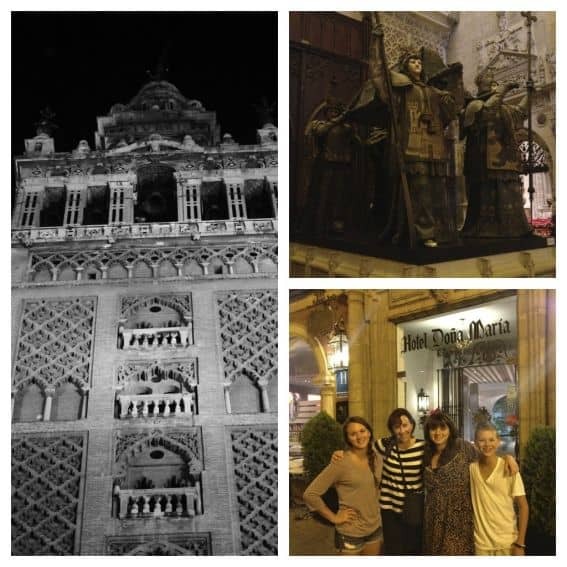 The eldest got the nod–so a Spanish-speaking country was on the itinerary. The youngest fancies soccer and carries an allegiance to Barcelona. The middle child voted for arts and theatre. This summer’s destination: Seville, Spain. After a week in Barcelona with extended family, we boarded the Renfe train to Seville for a scenic, 5+ hour, high-speed journey through the Spanish countryside. We arrived in the sun-soaked city during siesta time. Our boutique hotel, the Dona Maria, was just across from the Seville Cathedral: very reasonably priced, spacious by any standards, and offered loads of useful advice. Free Internet in our hotel was a rare Spanish luxury, and the rooftop pool and bistro were a welcome oasis. A 360-degree view of the ancient city from the roof was breathtaking at all hours of the day and night. We found our strolling pace as we explored the city from a horse drawn carriage–a common form of transportation and sightseeing in Seville. Statue performers and artists entertain in plazas and parks throughout the city. Numerous parks and small playgrounds around the city, including the grand Murilla Gardens, offer safe play spaces to run around, play, and view sculptures like the tribute to Christopher Columbus. When spirits need refreshing or a quick pick up, every corner offers Fanta, espresso, or ice cream treats. The Holy Cathedral Church of Seville, built in 1401, is the largest Gothic temple in the world. In addition to over 500 pieces of art/sculpture, the Cathedral contains the tomb/remains of Christopher Columbus with free entrance to children under 15. 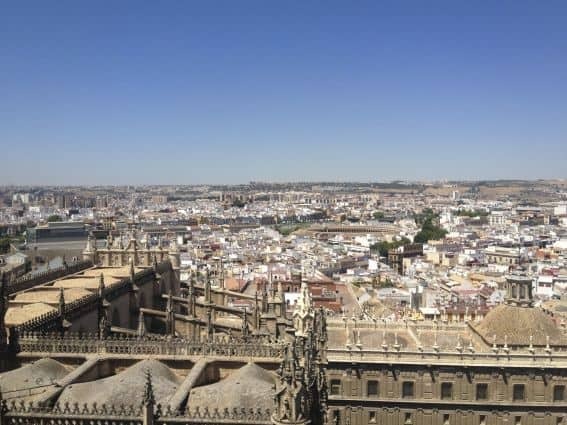 A rewarding climb up la Giralda, the 100-meter tall minaret (for another full view of the city), is accessed by 35 ramps, and only 3 flights of stairs at the top. There are museum displays and windows on every level of the bell tower so the walk is very entertaining. Bull fighting posters and statues were prominent throughout the city, and while we didn’t care to see a live bullfight, we visited La Real Maetanza of Seville and Museo Taurino. The Bullfighting Museum tells the regal story and history without seeing the action. It is one of the oldest and most beautiful rings in the history of bullfighting. As the sun sets, the temperature drops and people emerge from their regal buildings into the streets. The city is sparked into life. It’s common to eat dinner at 9 pm, so we had no trouble getting a great table earlier in the evening. 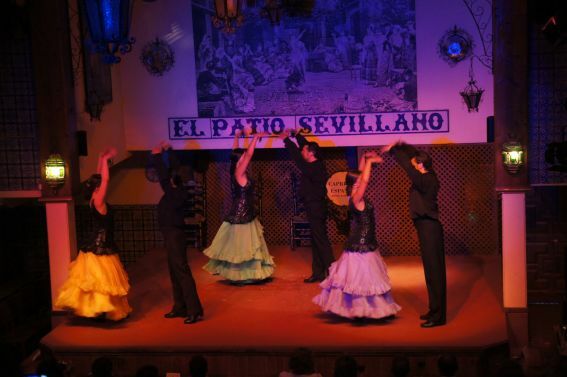 An early evening Flamenco dance at El Patio el Sevillano captured the flavor of the culture through the gypsy folklore: music, singing, clapping, stomping and thundering dance. Three days was a bit too short to see everything–we missed exploring the agriculture of the area (olives are a large product), the home of the luxurious Andulusian horses, and hiking in the surrounding hillsides. The educational bonus of visiting Seville (don’t unveil this to my children) was learning so much about Christopher Columbus and hence the background on the discovery of America. great! we enjoyed it ! !